On two hot Florida days, 150 strangers united to share a journey with Juno in spirit and to chase their own dreams. Leveraging a different technology they shared they experiences with the world. 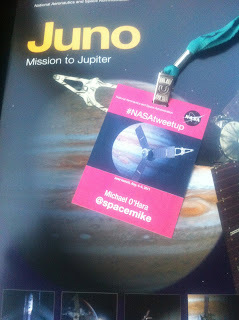 The NASA Tweetup provided access for the public to see behind the scenes of America’s Space Program. It offered a rare glimpse for space evangelists and advocates to get closer to the machines and people behind the passion. NASA provided the canvas and each participant painted the experience in 140 characters (or less). Over those two days, a who’s who of NASA scientists, mission managers, and leaders spoke to the invited guests. 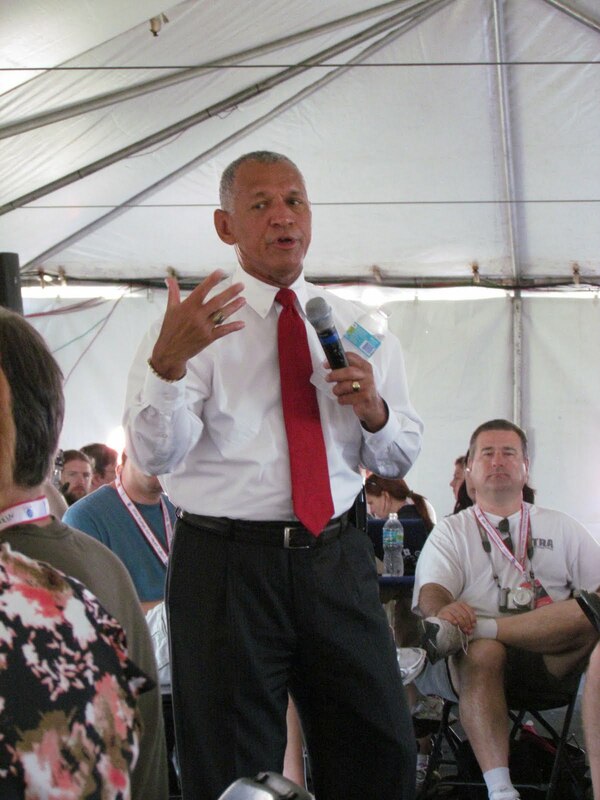 The company behind the technology spoke about the launch vehicle and the spacecraft, NASA Chief Scientist Waleed Abdalati spoke eloquently about exploring space while NASA Administrator Charles Bolden reiterated America’s commitment to a human presence in space and continued robotic exploration. Bill Nye the Science Guy brought his high energy and love of science to the crowd in a way that only he could. As each guest spoke, their words were captured by the attendees who sent them racing around the world at the speed of light. Each one of those messages began its own journey to space and perhaps it will be one of these messages that will find its way to a distant civilization long after planet Earth has disappeared. Those messages will tell the tale of a civilization that was not content to stand on their rocky planet, but one that sought to reach out to the stars to explore so that they could understand their place in the cosmos. Bill Nye made an astute observation when he told the crowd that there were more of us at the Tweetup than there were reporters covering the mission. That is where the most important benefit of the Tweetup delivers its true value. It is a “force multiplier”. Reporters covering the space program offer a snapshot, a point in time view of an event. This snapshot is like reading about how your favorite team did the day after the game, but not knowing where they are in the standings or the team’s capabilities and strategy. It is valuable information, but out of context to the bigger picture. This is where the members of the NASA Tweetup can offer their greatest contribution. Attending is not a “snapshot” event, but one that lives on. In addition to reporting “live” from the scene and providing a play-by-play of what was being said they also conveyed their passion for space. They told of what it felt like to be there standing in front of the Space Shuttle, or in the center of the Vehicle Assembly Building, to see a rocket riding a column of fire as is began a journey to our solar system’s largest planet. They went back to their respective cities and in some cases countries to share their knowledge and make the case for space exploration. All of that came not from someone whose job it was to tell the story, but from someone whose passion for space compelled them to share the story. It makes a difference. To a large extent, the public and the press associate space and the space program with sending humans aboard rockets. The face of space exploration may always belong to the ones that walked on the surface of the moon or rode aboard the Space Shuttle, but humans will not venture aboard vehicles like the fictional Starship Enterprise until robotic technology blazes the trail to test new technologies and explore unknown worlds. We are all children of the stars riding our own spaceship through the galaxy. Most of us spend our lives only looking around and not up at our past and perhaps our future. As I reflect back, the NASA Juno Tweetup was more than a collection of space followers getting together to enjoy the experience of a rocket launch – it was a call to action for us to do our part to ensure that space exploration, human and robotic, doesn’t end on our watch. The passion that the 150 felt must be shared with an infectious enthusiasm to all who will listen for why space matters. Long after the event, attendees will post photos and relive the experience with friends and family. They will write their blogs and share with hundreds more about the experience. For those that hear about the story it will be the next best thing to being there. It will be like having your own personal observer at the scene, but it cannot stop there. 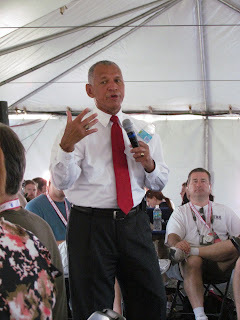 I challenge all NASA Tweetup attendees to think big in the spirit on those that dreamed of reaching the stars and those that worked to make those dreams a reality. As space exploration comes under increasing pressure we must counter those that say science does not matter by reaching out in our own community. This after all was NASA's goal, to create ambassadors for space with a message to all who will listen. Share your experience by writing an editorial, submitting an article to a local magazine or newspaper, start a blog, reach out to a local television or radio station, or dream even bigger dreams. Very few high schools in the United States have a space program. You may be thinking that you never knew any existed at all, but it is true. Anacapa School in California is one and Columbus High School in Georgia is another. Columbus High School has partnered with Auburn University and the results are amazing. They have built a program that educates and inspires their classmates to aim high. They focus on robotics, launch rockets and high altitude balloons with onboard science experiments that they have enginneered. Alumni of the program have gone to to Georgia Tech, Notre Dame, and MIT to name a few. Perhaps a school near you would be interested in pursuing such a program. What better way to contribute to the future of space exploration than by energizing young minds today? By virtue of us being an alumni of the Juno Tweetup, we share a common interest, experience, and now friendship. As individuals we are strong, but together we are a community -- and a community united in purpose spread around the United States and several points around the planet is powerful force. We can make a difference! Lastly, I want to offer my sincere thanks to the NASA team for hosting and inviting me to this event. A passion for space exploration has been a common thread throughout my entire life. Born as the space race began it captured my imagination and created a lifelong curiosity to understand and explore the universe in which we live. A typical year will not go by without a trip to KSC to watch a launch or just be close to that passion that lives within me. It may sound silly to some, but growing up in the space age made those events a part of me. Standing in the Vehicle Assembly Building, out at the Juno launch pad, listening the speakers talk about the mission only served to reinforce that passion. People who know me, will tell you if its about space ask Mike, people from my past will say "that's the kid that wanted to be an astronaut". Whether the audience is one, ten, a hundred, or a thousand you will find me selling the virtues of exploring space. Those two days have motivated me to do even more for the cause of space exploration. Over the coming weeks I will follow that passion. More details to come, but it will involve a persistence to do my part and return back to the space program a small part of what is has given me - a desire to understand our universe, a pursuit of learning and knowledge, inspiration, and dreams of what we can accomplish.